William Hartley worked as Town Marshal, and also operated a local eatery. William Hartley was born November 3, 1908 in Carlisle, Kentucky to Willard and Dorothy Hartley. He was the oldest of nine children. William spent a short time in the U.S. Navy and after being discharged he moved to Washington State where he met and married Dorothy Rogers in 1930. Around 1942 they bought and ran the Victory Inn Cafe in Issaquah which they sold in 1945. It was during this period that William served as Town Marshal. He left the office of Marshal went on to run a taxi service in North Bend. 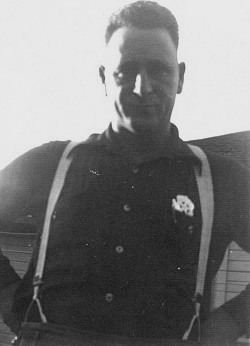 About 1949 he moved to Alaska and was a Ketchikan City Policeman until the early 1950’s. He then moved back to the “Lower 48” and went into the tavern business, among them being the tavern at the Eagles Lodge in Issaquah. He retired in the 70’s and moved to Florida where he passed away in 1978 at the age of 70.